Brazilian police have occupied a Rio de Janeiro shantytown as they hunt for the killers of six teenagers, whose bodies were dumped at the side of a road. Officers moved into the Chatuba slum early on Tuesday and made several arrests, Brazilian media reported. Police believe the young men, who had gone to bathe at a waterfall, were murdered by local drug lords. There were emotional scenes as family and friends gathered at the wake for the teenagers, who were aged 16 to 19. Several mourners fainted, including the mother of one of the teenagers, the Globo website reported. The young men went missing on Saturday. Their bodies, displaying signs of torture, were found on Monday morning at the side of a road that is being widened for the 2016 Olympics. Police say they believe local drug bosses were behind the killings. The victims, who had no criminal records, were probably targeted just for coming from an area under the control of a rival gang, officers said. A dozen people, including the six teenagers, have been killed in the area in recent days. Some 250 police officers took up positions early on Tuesday in the Chatuba favela, on the outskirts of Rio de Janeiro city. 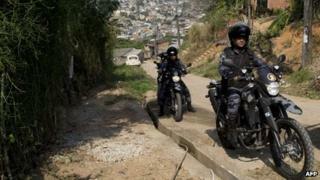 Many of Rio's biggest slum areas have been occupied by police and the army as part of a "pacification programme" ahead of the 2014 football World Cup and the Olympics. The authorities say their "pacification programme" has managed to reduce violence and restore the dignity of hundreds of thousands of people who live in the city's poorer quarters.